"My mother got this recipe back in the 1950's from the minister's wife. 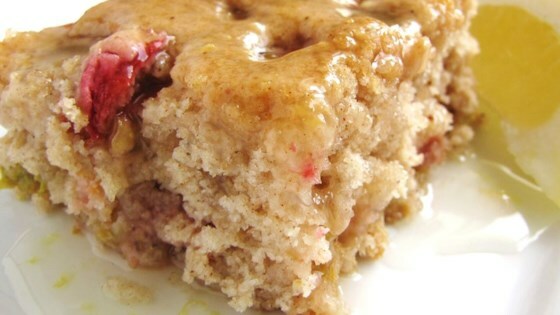 It's been a family favorite ever since--even for those who claim to dislike rhubarb." Preheat oven to 350 degrees F (175 degrees C). Grease and flour a 9x13-inch pan. Sift together the flour, baking powder, salt, cinnamon, nutmeg and cloves. Set aside. In a large bowl, cream together 2 tablespoons butter and 1 cup sugar until light and fluffy. Beat in the egg. Beat in the flour mixture alternately with the milk, mixing just until incorporated. Stir in the chopped rhubarb. Pour batter into prepared pan. Bake in the preheated oven until a toothpick inserted into the center of the cake comes out clean, 45 to 50 minutes. Allow to cool before slicing. To make the Lemon Sauce: In a saucepan, mix together 2 cups sugar and 4 tablespoons cornstarch. Stir in the water. Cook over medium heat, stirring constantly, until mixture is thickened. Remove from heat and stir in 4 tablespoons butter, lemon zest, lemon juice, and extract (if desired). Stir in 1 or 2 drops yellow food coloring, if using. Serve slices of cake with the warm lemon sauce. Light, lemony and refreshing pudding cake. You can add lemon extract if you like a tangier sauce. This was a perfect little cake. I added a little extra spice. The lemon sauce is a must to finish this off. I tried this cake for Fathers day, Everyone loved it. With or without the lemon sauce it is tasty. Hint: try the lemon sauce on other desserts, It is delicious!! I made this without the lemon sauce to bring to an afternoon tea. Everyone loved it! Even my student who said he had been "scared of rhubarb" before this had two pieces. Definitely a winner! Excellent moist flavorful cake. We ate it all before I ever got around to making the sauce!